CarlSandburgLibrary is a Legacy Library. Legacy libraries are the personal libraries of famous readers, entered by LibraryThing members from the Legacy Libraries group. CarlSandburgLibrary is also an author. 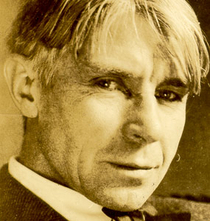 » See Carl Sandburg's author page. About meBorn January 6, 1878 Galesburg, Ill.
Died July 22, 1967 Flat Rock, N.C.
About my libraryThe library listed here is the portion that remained at Connemara, my farm at Flat Rock, NC, after I sent the rest of it to the University of Illinois. It was cataloged by the National Park Service and was sent to the I See Dead People['s Libraries] volunteers by them. It is a family library and includes; some of my Lincoln research, folk tales, political books, and pleasure reading. Our library includes Paula's (Lilian Steichen Sandburg) goat books, Swedish books, my parents were from Sweden, and a number of yearbooks and textbooks that were dedicated to me or used excerpts of my work. Some of my granddaughter's books are in here too. There are also several books with my brother in law and good friend Edward Steichen's work in them.